Welcome to Finding My Strong Blog’s first ever guest series. Over the course of the next 4 weeks I will be adding two guest posts from a wonderful writer who not only happens to be my best friend, but happens to be finding her own strong this year. Her journey through cancer, weight loss, and Hypothyroidism is one you won’t want to miss! Christy is a professional counselor and Mobile Crisis Team Specialist living in Annapolis, MD. Between lifeguarding for six years and subsequently responding to crisis situations with local police, Christy has learned to handle adversity, keep her cool, and how to make a plan of action. Christy is a strong believer in gaining support and learning from others and hopes to pass on some of what she has learned along the way. Christy’s journey to finding her strong is ongoing and you can follow Christy on Twitter: @beachnative27, on Instagram: beachnative27, and even on Snapchat for motivational gym snaps: (you may have guessed it…) beachnative27. Now join me as we learn more about to to build strong and healthy bodies through Christy’s inspiring journey. Growing up I was that kid at the beach. You know… that pale kid… slathered in sunblock… wearing the oversized shirt… under the enormous umbrella. That was me from the time I was born until I became a teen and could conveniently “forget” to put on sunblock, or I could choose to toss off the shirt and escape the umbrella in search of a tan. I’m pale, that’s just a fact of life for people with strong German and Irish heritage; so the sun can be a major problem. I’ve always been pretty good about wearing my sunblock when I’m outside, and even though I have never once stepped foot inside a tanning bed, I still got cancer. I love the sun! Growing up in San Diego on the beach and then lifeguarding each summer after moving to the East Coast meant that I saw a ton of sun as a kid. I still see it all the time between my various activities because my favorite place to be is outside. I was 18 years old when I was diagnosed with my first Stage 1 Melanoma. It was a small spot on my arm that I overlooked given my many freckles and moles; it simply looked like an extra dark freckle with a light colored ring around it. I asked my dermatologist for a mole check to have a baseline – for future problems I thought – when I was 18 and walked out with a bandage over my biopsy site thinking it was no big deal… but it was. I had cancer. I am very blessed that all three of my melanomas were caught early and I have not had to undergo aggressive treatment like some of the people in the attached video. I have had one removed from the topside of my right forearm (2007), one removed from my left shoulder blade (2012), and one removed from the backside of my right ear (removed one month ago). The common factors about all three sites are that they see a lot of sun when you are not careful and consistent with sun block. I’ve played sports my entire life, and currently I have gotten involved in league sports as well as pursuing fitness for my own goals. As I mentioned previously, I love to be outside so sunblock has become a permanent sidekick of mine. The various manufacturers have made it so convenient to wear that there are no good excuses to skip it. I’m outside a lot so I carry lip balm that has sun block in it with me at all times, and I make sure to apply sunblock at least ten minutes before my activity and then reapply every hour to two hours. I also make sure to use a spray sunblock to go over the part in my hair and my scalp. I’m not perfect, I still get sunburns, but I do my very best to protect myself from further sun damage and cancer. Don’t get me wrong, the sun is your friend. You need vitamin D for strong bones and you need sunshine to improve mood; but you don’t want to get so much that it ends up harming you. Learn from my experience and don’t face going in for biopsies of suspicious sites every six months (I have 12 scars from skin biopsies), wear your sunblock. When you go out running, swimming, biking, hiking, or any other type of outdoor activity… WEAR YOUR SUNBLOCK! Wear your sunblock even if you are only planning to be outside for an hour and wear it even if it is cloudy outside (cloudy days and water activity are deceptively dangerous for sun damage). If you have freckles and moles, no need to panic! Just make sure that you know your body; keep track of your freckles, moles, and skin in general. If you notice changes in size, color, or shape be sure to get it checked out by a dermatologist. It’s smart to get freckles and moles checked by a dermatologist every couple of years just in case. As my dermatologist put it… skin cancer can pop up where the sun don’t shine … and she ain’t kidding. If you really want that tan, consider getting a spray tan. Check out the link below and consider this… “Just one indoor tanning session increases users’ chances of developing melanoma by 20%1; and people who first use a tanning bed before age 35 increase their risk for melanoma by 75%2. Knowledge is power, learn from others’ experiences and protect your skin so that it can protect you. Lazovich D, Vogel RI, Berwick M, Weinstock MA, Anderson KE, Warshaw EM. 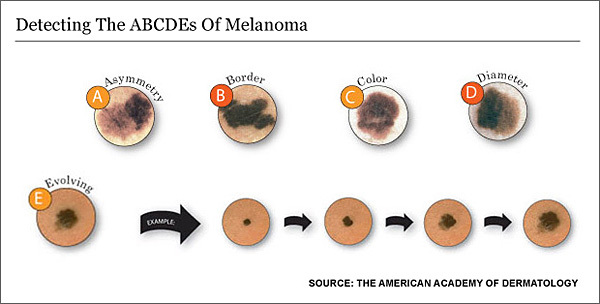 Indoor tanning and risk of melanoma: a case-control study in a highly-exposed population. Cancer Epidem Biomar Prev 2010 June; 19(6):1557-1568. You are doing a great job preventing and helping spread the message! I know I regret the many days I laid out and tried to tan by the pool, it’s not worth it! Thanks for this! I’ve had 3 spots excised and it makes me sad every time! I don’t know many other people who’ve had to worry about skin cancer, so I really appreciate you sharing your story. We are happy to hear that you are staying on top of your spots and making sure you get them properly checked out! Keep spreading awareness and hopefully more young ladies like ourselves can prevent future skin cancer victims. I think about this all the time…Dear us, don’t we wish we could go back and be wiser? Every day, every day…sun screen no matter what. It is in all of our creams and face products now, so there is no excuse. Our children need to have it on. Thank you for this post, I hope “younger” people read this. So glad to hear you are okay and can still enjoy all your favorite outdoor activities. I’m happy to share my story because I feel like we learn so much from each other. It’s such a simple thing to put on sun block but so many of us choose not to, I can’t help but try to keep the good fight going :).